Last Sunday I taught a cookie-making workshop. Debra initiated the workshop as a get-together idea with friends. During the three-hour event, we talked about cookie methods, ingredients, techniques and tips to make, shape and store cookies. My goal was to keep the group interested and entertained by explaining baking process, answering questions, and getting them involved as much as possible. I enjoyed having the group roll, scoop and assemble cookies. We made gingersnaps, rugelach, chai butterballs, korova cookies, and orange almond biscotti. 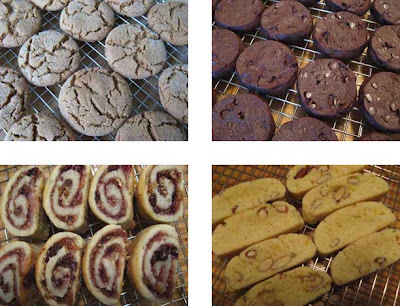 I supplied everyone with a small booklet/collection of cookie recipes. I think that we had a good time, and everyone left with cookies. All in all, it was a fun day of baking and eating. Posted by Sam at 10:39 p.m.
those all look great. wish i could have attended! 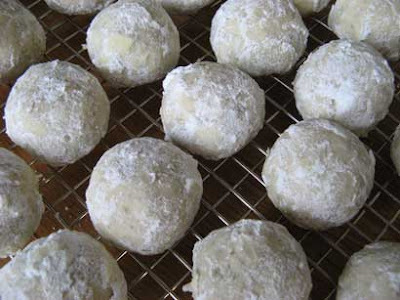 could you maybe supply a recipe...for the Chai Butterballs, perhaps? They sound delicious! Thanks. What a fun idea. Maybe next year I will gather my friends up. What beautiful cookies! Great idea to have a cookie workshop! I sometimes have a baking day with a friend who also loves to bake. But this workshop sounds like a perfect idea for a bigger group of friends. So nice that they can all take home the produce. My friends and I were also going to attend a soup workshop. Unfortunately here in Holland it seems impossible for most people to make time for these finer things in life (esp. at the same time). Time seems to be the one thing that nobody has enough of.